Alison Parker's father Andy on gun control: "We’ve got to do something about crazy people getting guns." Parker’s boyfriend Chris Hurst, her father Andy, and Fox News’ Megyn Kelly. 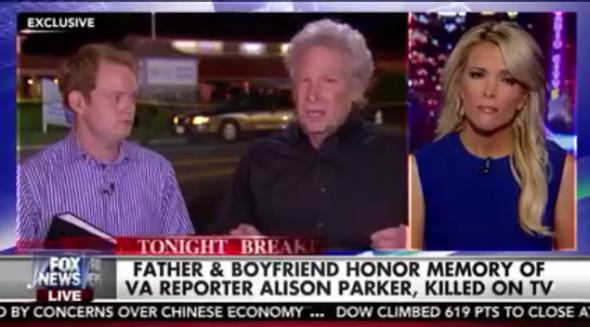 Via ThinkProgress, here’s video of Virginia shooting victim Alison Parker’s father Andy emotionally promising that he will campaign for laws that keep handguns out of the possession of unstable and potentially violent individuals. “Our former life is now in our rearview mirror,” Sandy Phillips wrote on Facebook as she and her husband, Lonnie, locked the door of their San Antonio home and steered their new camper north, toward Colorado and the trial of the man who killed their daughter, Jessica Ghawi … the Phillipses have traveled the country, arguing for gun control and background checks, unsuccessfully trying to sue ammunition manufacturers, and telling stories about Ms. Ghawi, a 24-year-old budding sports reporter. Early in her congressional career, Carolyn McCarthy’s plea – rare in politics – was, “Let me go home!” That is, pass gun control laws and let me retire, having done what I came to Washington to do. Now, after 18 years, she finally is going home … But she goes home having accomplished almost none of what she hoped to accomplish when she first ran as a gun control advocate. It’s still legal in most states to buy a gun from a private dealer without being subject to a background check, while even background checks on regulated purchases can fail to identify individuals who should be denied guns because sellers are allowed to go forward if the check hasn’t been completed in three days.